The Salt Lake Tribune: Miranda Cosgrove, the 17-year-old star of the popular Nickelodeon TV show "iCarly," showed up at Crescent Elementary School to meet with more than 90 fourth-graders who had won a local radio station contest that revolved around bullying. "It’s a really great cause," Cosgrove told media after the event. She attended school until the fifth grade, she said, and had experienced bullying at school. (Miranda Cosgrove, star of "iCarly," talks to Utah students about bullying). Ventura County Star: The popular children's television network Nickelodeon is the latest voice to raise awareness of digital bullying. The issue has received national attention after the suicides of teenagers who were cyberbullying victims. President Barack Obama held a White House conference on bullying earlier this month. Nick is collaborating with the advocacy group Common Sense Media, which has also worked with MTV and the Disney Channel on spreading the word about the issue. The hope is that the anti-bullying effort can become as pervasive and successful as campaigns calling for a designated driver who has not consumed alcohol when friends are out drinking, said James Steyer, CEO and founder of Common Sense Media, which offers reviews and advice for parents (Nickelodeon launching anti-bullying campaign). Miranda Taylor Cosgrove (born May 14, 1993) is an American film and television actress and pop recording artist. Cosgrove played the roles of Megan Parker in Drake & Josh and title character in iCarly. Her career started at the age of three, participating in television commercials. Cosgrove's film debut was in 2003, as Summer Hathaway in School of Rock. After years of small television appearances, Cosgrove was cast into the hit show Drake & Josh and later in iCarly. 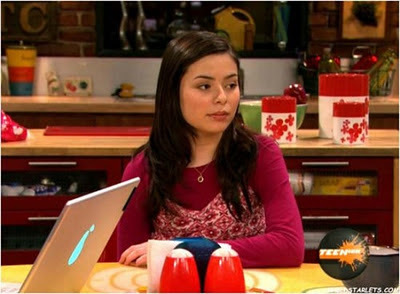 Cosgrove earns $180,000 per episode of iCarly, making her the second highest paid child star on television. Following the success of iCarly, a soundtrack album was released in June 2008, in which she performed four songs. Cosgrove's debut album Sparks Fly was released on April 27, 2010 (Wikipedia). Nickelodeon (TV channel) (usually abbreviated as "Nick", and originally named Pinwheel from December 1, 1977 to March 31, 1979, and stylized in its current logo as nickelodeon) is an American cable television network owned by MTV Networks, a subsidiary of Viacom International. The channel is primarily aimed at children ages 6–17, with the exception of their weekday morning program block aimed at preschoolers ages 2–5. Since 2006, Nickelodeon has been run by MTVN Kids & Family Group President Cyma Zarghami (Wikipedia).